Spectacular scenery, peace, proximity and security are just some of the reasons residents say they love living in Casas de San Juan. 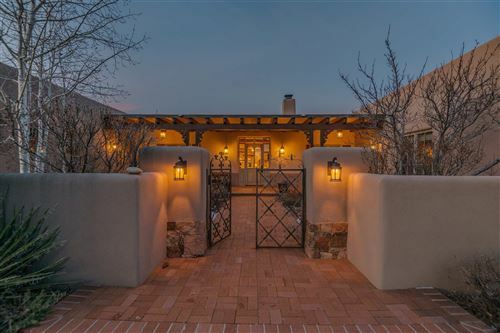 This gated community of luxurious estate homes and free-standing condos is ten minutes north of The Plaza, next the Santa Fe Opera. Casas de San Juan’s setting of rolling, tree-studded hills with views of magnificent mountains puts Nature at center stage. Lot sizes for the estate homes vary from approximately three to more than ten acres. 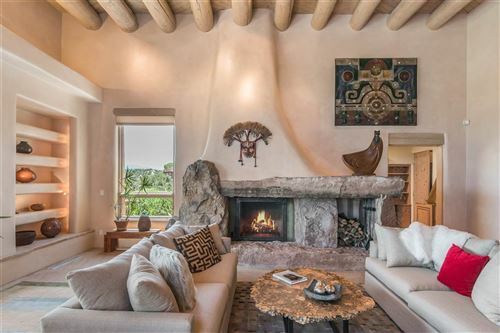 Home designs include traditional Pueblo, Territorial and Contemporary styles. Carefully planned siting means that even the condos benefit from the community’s expansive feel. Many properties enjoy exhilarating views of the Sangre de Cristos, the Jemez Mountains or the dramatic Badlands. As a nod to its situation, Casas de San Juan named some of its streets after renowned opera houses, operas, singers and composers. La Traviata, Caruso, La Scala and even Camino Crosby –named for the beloved founder and former general director of The Santa Fe Opera– remind residents that the world-class operatic venue is within walking distance of their entry gate. Casas de San Juan is just minutes from the grocery stores, boutique shopping and restaurants of DeVargas Mall. The nearby Tesuque Village Market, open 7-9, seven days a week, is a terrific nearby spot for dining or to pick up dessert, wine or quick provisions for a meal at home. For more info on Santa Fe NM Neighborhoods.